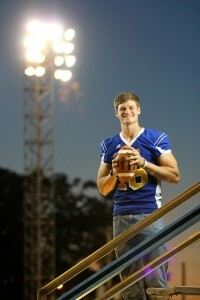 For Mulerider quarterback Tyler Sykora, football was never a priority growing up in Hot Springs Village. It was something he loved playing in the backyard with his brother, but not on an organized team. “I always loved sports, but I didn’t play football until my sophomore year in high school. I guess I was distracted by basketball,” said Sykora. Basketball might have seemed the logical sport for a six-foot, six-inch tall kid, but his high school coach asked him to join the football team. “It was fun, but I didn’t do much in high school. There were no awards or accolades, no stats – I underachieved,” he said. Fracturing a vertebra in the second week of his junior year took him out of that season, which left his senior year to impress the recruiters. According to Sykora, his tall frame and potential drew interest from larger schools. “But, when it came time to play, I didn’t have what it took. All of the recruiters kept passing me by,” he said. Through all of the disappointments, Sykora maintained a feeling that God was leading him to where he could find purpose. “When all of the big schools kept closing doors, Coach [Bill] Keopple saw something in me and stayed in touch. He called me every week. They were some great recruiters and really made me feel wanted,” he said. By the second time he was approached by SAU, Coach Keopple was leading the Mulerider football program and his “pro-style” fit more with Sykora’s strength − throwing. In his relatively short football career at SAU, Sykora has broken school records and helped lead the Muleriders to an impressive 8-2 winning season in 2012. When his record-breaking college career is brought up, the Mulerider quarterback is quick to share the credit. “As a quarterback, none of those records could be made without teammates. No single record was mine. There had to be someone there to catch the ball and to run and to block. My offensive linemen have become my best friends,” said Sykora, speaking of fellow seniors; right tackle Lance Castleman (who made first team all-conference), right guard Jeff Bordelon and center Andrés Molden. Sykora plans to attend seminary in the future, but for right now, he said he feels like he is where he is meant to be. Spare time is spent with his Magnolia church family (First Baptist Church and the Association of Baptist Students campus ministry) and being of service to the community. He participates in community outreach with the Muleriders in Magnolia, SAU’s community service program for athletes.